Facebook’s Events page is one of the most effective tools for marketers on the platform. Any event, whether real or virtual, can provide a useful focal point for any marketing effort. When done effectively, an event can create a ‘buzz’ around your company or brand, leading to plenty of genuine interactions via social media that can help you to obtain the visibility you are looking for. Up until fairly recently, the process for getting your event pages to perform well on Facebook was fairly simple. 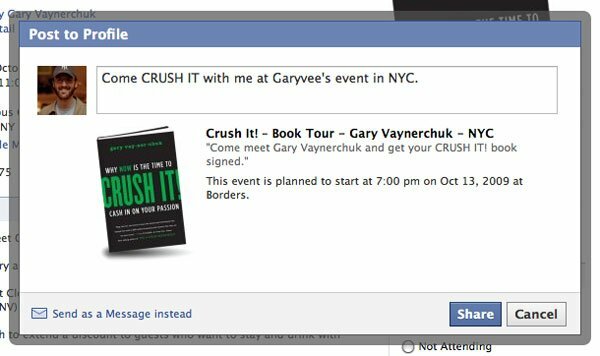 You created an event page, you’d get all the people involved to invite their friends and post on the event page. With a combination of gentle coercion and goodwill, it wasn’t too hard to get events to pop up in lots of people’s news feeds. This was a great system. It really worked well for a lot of people. So why can’t you do this now? Well, this system was working a little too well for Facebook’s liking. In recent times, and especially since their listing on the stock market, Facebook has come under increasing pressure to monetise their most popular – and commercially advantageous – services. Their ‘Pages’ function was the most obvious victim of this policy – everyone must have seen those pleading status updates from Facebook pages about having to select their page in their ‘interest lists’ in order for them to appear in their news feed. Which, of course, very few people did at the time, because it’s obviously going to be a hassle. Now, if you want things to appear in people’s news feeds, you need to pay Facebook. And unfortunately for regular users of the ‘Events’ function, there is a similar policy at work there. If you post on an events page, it only turns up in the news feeds of people who have clicked ‘attending’ for that event, and to a lesser degree those who have clicked ‘maybe’. Those who have been invited but have yet to respond – probably the most important group to target with this kind of news feed visibility – are kept in the dark, as are those that fall within the wider reach of the poster. There are. however, a few work-arounds that can help you to gain visibilty for your event without having to pay through the nose for it. You know all those people that you’ve asked to post on the event page? Well, while it’s good to have the event page looking populated and engaged, it’s more important to have people talking about your event outside of the confines of the event page, because this will gain much wider visibility. So, if you’re going to coerce people into creating a buzz for your event, share the event page to your personal timeline, and try to get a conversation going in this post thread. This can be done by posing a question along with the event link. Although it could pay to strong-arm a couple of your collaborators/employees into responding to the question just to boost the initial visibility and reach of the post, a truly engaging post will stimulate those outside of your sphere of influence to respond. It might be something topical, or silly, or both – anything that gets a bit of good-natured banter on the go will superglue your event page to the top of people’s news feeds far and wide. In general, shared content such as videos, images, or articles tend to provoke the biggest reaction on Facebook, but when you share an event, you can’t really do this. Facebook will only allow you to share one thing per post, so you either have to share the content on the event page and get seen only those who intend to go, or share the event without content. However, if you share the event in such a way that it frames a stream of content – for example a stream of TV clips or songs related to a particular subject – then you can get the best of both worlds. 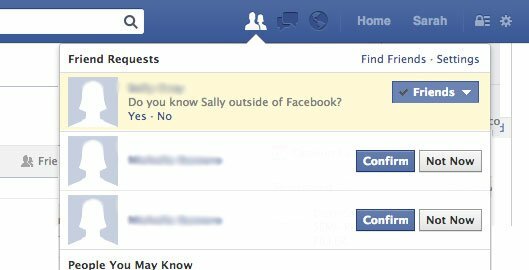 Another recent initiative from Facebook has been the introduction of the “do you know this person outside Facebook?” prompts when you respond to friend requests. This is an attempt to stem the flow of MySpace-style friend adding on an industrial scale, and an extension of the policy of not allowing anyone to have more than 5,000 friends. The predicament that Facebook finds themselves in here is as follows. Aggressively adding friends can significantly improve the reach of your posts, but Facebook doesn’t want people to do this. But yet, it needs to err on the side of caution when it comes to suspending/banning accounts, as a big crackdown would hurt their headline statistic – the number of active users – in an uncomfortably big way. The share price would dip, and that’s the last thing Zuckerberg and co want after only just recovering from the massive post-IPO price slump. So, for the near future at least, this remains a highly effective strategy for small businesses. You can easily identify people and accounts that are using Facebook for promotional purposes. Rather than a few hundred friends, they have a few thousand. And with a few clicks, these accounts can invite thousands of people to an event. Hence the prevalence of personal accounts that clearly represent small businesses – sometimes with a slight grammatical quirk in the user name to convince Facebook that they are a real person – and also personal accounts that clearly extend beyond real-life networks. It’s relatively easy to build these up – all you need is a critical mass of ‘friends’ made up of other feeder accounts in a related endeavour, and from there do friend requests on accounts with a suitably healthy amount of mutual friends. If you target the right type of accounts – ie people that aren’t necessarily trying to keep their Facebook account as a private forum for their close contacts – then it’s unlikely that you will get suspended for using Facebook in the way its makers didn’t intend. When presented with a list of friends to invite to your event, Facebook gives you a giant list to tick off. And unless you have a very small list, this is going to take you ages to do. There are, however, things you can do to expedite this process, such as using third-party browser plugins and hacks. Facebook doesn’t want you to do this, which is why it periodically contrives to make these stop working. Whenever this happens, all you need to do is perform a websearch for “facebook event select all [insert month/year here]”. This should provide you with a technique that is known to work at the time of writing. After all, it’s better than getting RSI!